Since its opening in 2016, the Kaplan Center has been about more than just exercising, swimming or playing intramurals. It’s about fostering a sense of belonging, not just among UNCG students and faculty, but among the larger community in which it’s located. That’s one of the things that Group Exercise Instructor Deja Lawrence likes most about her job at the center. But it’s not just students who benefit from the center, says Lawrence. Lawrence started with the Department of Recreation & Wellness as a Fitness Assistant, but a group exercise instructor suggested she try out for dance instruction after spotting her dancing to the background music while at work. “I like to dance, and smile at people and give them that positive energy,” says Lawrence. Lawrence hopes to use the skills she learned working for Recreation & Wellness to pursue a career as a fitness coach. If you’re climbing the three-story rock wall at the Kaplan Center for the first time, you can be sure you’re in good hands with Outdoor Adventures employee Emmanuel Fletcher. Fletcher is a “belayer,” or the one who holds the rope as the climber ascends the wall. If you’ve ever peered over the railing at the base of the wall on your way to the two-court gym or the Natatorium, he’s the one you see who’s letting out or taking in the rope that the climber is suspended from while giving them direction and encouragement. One way that Fletcher gets novice climbers in the right frame of mind is to build a sense of trust with them. “I always have them and let them know that I’m not going to drop them,” he says. “I have them go a few feet up the wall and let go, so they know that I’ve got them.” Fletcher holds them in place using a device, the belay, that locks the rope so that the climber won’t descend any further. Fletcher says the best part of the job is getting to know people. “It’s always fun to have a conversation with new people, people who have never climbed before,” he says. Everyone should come to the Kaplan Center at least once during their time on campus, says Fletcher, and enjoy an atmosphere that encourages people to push themselves. “It’s an open space for everyone,” he says. “Everyone is just friendly and open to the people who come here.” To learn more about the climbing wall and all that Outdoor Adventure has to offer, visit recwell.uncg.edu/oa . Working for the Department of Recreation & Wellness at UNCG can offer one a wide variety of on-the-job experiences, from skiing the snow-clad slopes of Virginia to developing marketing material for the department, says senior Donald Komondy. Komondy also likes his job with the department’s Outdoor Adventures Program, where he helps students navigate the Kaplan Centers’ three-story indoor climbing wall or accompanies them on Adventure Trips to the great outdoors. And his favorite trip with Outdoor Adventures? Do you have multiple talents you would like to share with the UNC Greensboro Community, consider joining our team. The Departement of Recreation & Wellness is hosting an Employment Expo, February 12th from 4pm – 6pm in the Kaplan Center. Ready to apply? Submit your online application at recwell.uncg.edu/employment. The UNCG Department of Recreation and Wellness offers more than just team and group activities at the Kaplan Center. Students can arrange to meet with a personal trainer such as Preston Ellington to help them set and reach their own individual fitness goals. Students can fit time with a personal trainer into their school schedule, says Ellington. Ellington says the best part of the job is helping someone reach the goals that they’ve set for themselves. The lessons you learn in working with a personal trainer can last a lifetime, says Ellington. For more information on the personal training program or to schedule a consultation, visit the personal training homepage at recwell.uncg.edu/fitness. Some employees like the Department of Recreation & Wellness so much that they pull double-duty, serving in two different capacities. One of those employees is Rebecca Bischoff, who works in both the marketing department and as a lifeguard. Bischoff says that she also enjoys the fast-moving environment of the marketing department. One of the most interesting projects she worked on was an Avengers-themed T-shirt for Intramural Sports. There are a lot of activities going inside at the Kaplan Center on any given day: intramural sports, fitness classes, swimming, or people just jogging around the indoor track. What a lot of people may not know is there are lots of outdoor activities available to students as well, as Outdoor Adventures employee Alex Scott will tell you. For those of you who may have forgotten to bring your backpack to campus, or couldn’t fit your canoe in your dorm room, Scott says don’t worry. Outdoor Adventures can take students and staff further afield than one might think. One of the big draws of UNCG’s Kaplan Center is its two pools, and if you’ve ever spent any time around water you know that safety always comes first. That’s why lifeguards like junior Tyler McKee are always on duty when the pools are in operation. McKee says that a friend who knew one of the lifeguards recommended the job to him. Students should take the time to check out the Kaplan Center and see what programs and activities are being offered, he says. RecWell offers lifeguarding certification course as well as other American Red Cross safety courses during the school year. You can see the current schedule of course at recwell.uncg.edu/aquatics. The Kaplan Center is a big facility, with its multiple workout studios, basketball courts and swim areas. 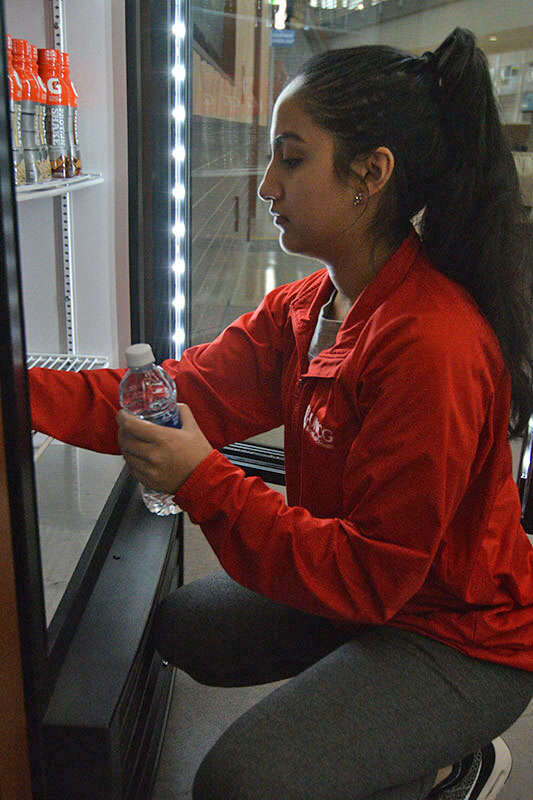 Big facilities take a lot of work behind the scenes to make it function, says Fitness Program Assistant and Facilities Supervisor Iqra Malik. Malik says the most challenging part of her job is if someone gets hurt and following the entry protocol for access to the center, but the friendly atmosphere and emphasis on fitness is what makes her work special. It is quite common for our student staff to work across multiple program areas. To see all employment opportunitis, visit our Employment Page online. 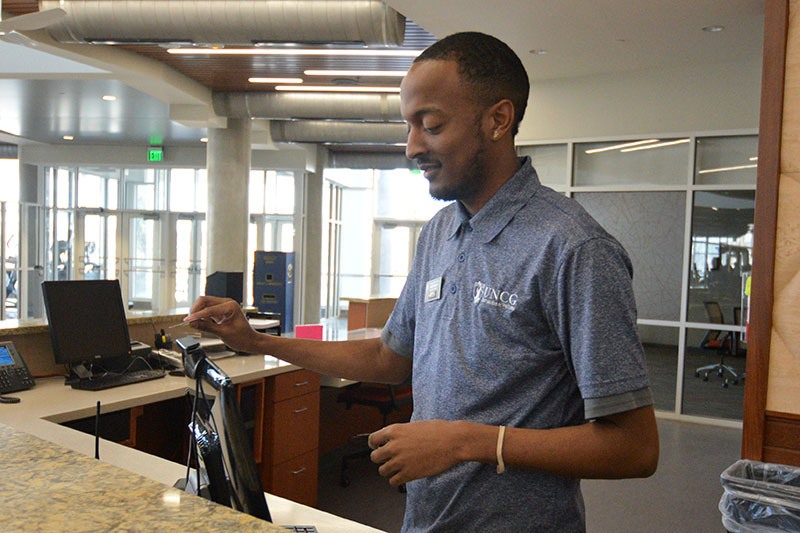 Caption: Malik straightens the drinks at the front desk cooler, one of the many small details that she oversees as a facilities supervisor. “Poet Robert Frost spoke about “the road not taken,” but the staff at Recreation & Wellness’s Outdoor Adventures are always trying to create new paths, especially on the Kaplan Center’s three-story climbing wall. Caption: Samantha Gaillard (top) and Anton Parker (right) lay out new climbing routes at the climbing wall in the Kaplan Center.We’re taking down routes and resetting them,” said sophomore Samantha Gaillard, who was working on the climbing wall with fellow Outdoor Adventures staff member Anton Parker. “People want new things. We’ll be changing all the climbing routes in time for the climbing competition.” Changing the climbing routes involves removing the hand and footholds on the wall and moving them to new locations. Gaillard likes helping to improve the student experience at UNCG. The 20th Annual Spartan Summit Climbing Competition will take place February 17 at the Kaplan Center. For more info, go to recwell.uncg.edu/summit. 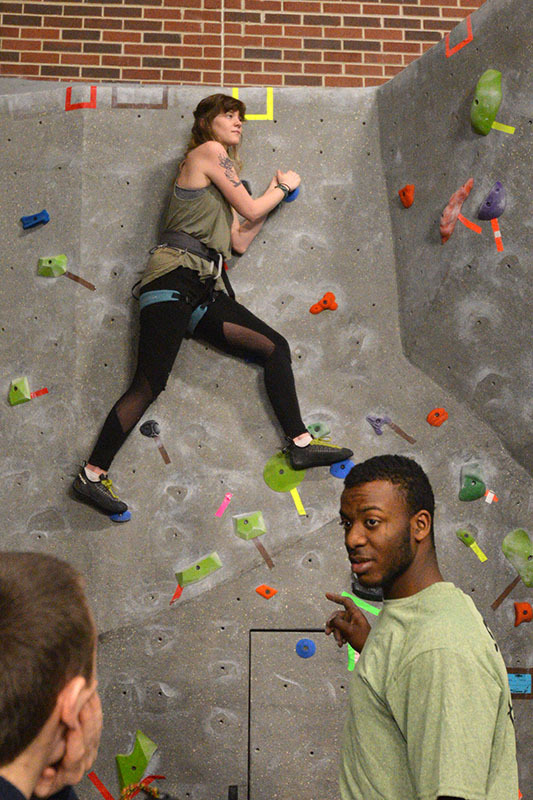 Caption: Samantha Gaillard (top) and Anton Parker (right) lay out new climbing routes at the climbing wall in the Kaplan Center. Jalien Byers says one of the best things about his job with the UNCG Department of Recreation & Wellness is interacting with the influx of students and faculty who come into the Kaplan Center everyday. Byers also enjoys the responsibilities of his job. In addition to Jalien’s role as a student employee, he also serves as the President of the UNCG Men’s Basketball Club which is part of RecWell’s Club Sports program.